Do you have to be slightly odd to drink goat's milk? Or is it the drinking of goat's milk that makes a person slightly odd? One of life's burning questions to which there is no answer I feel. However, it must be said that many of my customers are rather unconventional and, in fact, one of my shopkeeping customers always complains that his shop is always full of 'mad people' waiting for the goat's milk delivery to turn up! I would hate to think that we were boring! As I have said before, one of the absolute pleasures of doing farmers' markets is the opportunity to meet our customers personally and get to know them a little. I absolutely LOVE meeting all my customers as they are all such interesting and enthusiastic people. And some are clearly totally mad! Take Sara, for example. She is 'mother' to GeeGee the parrot whom we have met in an earlier blog. I have come to the conclusion that she is even more eccentric than I am - for those of you who know me, you may find that hard to believe. But here's the proof ... Sara has mentioned in a couple of her emails that GeeGee goes with her into the office some days. There was me thinking that Sara probably works from home ... but no. She puts GeeGee into a ferret travel cage, covers her with a Primark 'Vuitton' bag and then takes her on the bus into the office! And what's more, GeeGee will be coming to visit me at my London market this weekend! I MUST remember to take my camera with me. I can't wait! And when Sara does voluntary work 2 days each week, GeeGee is left at home. 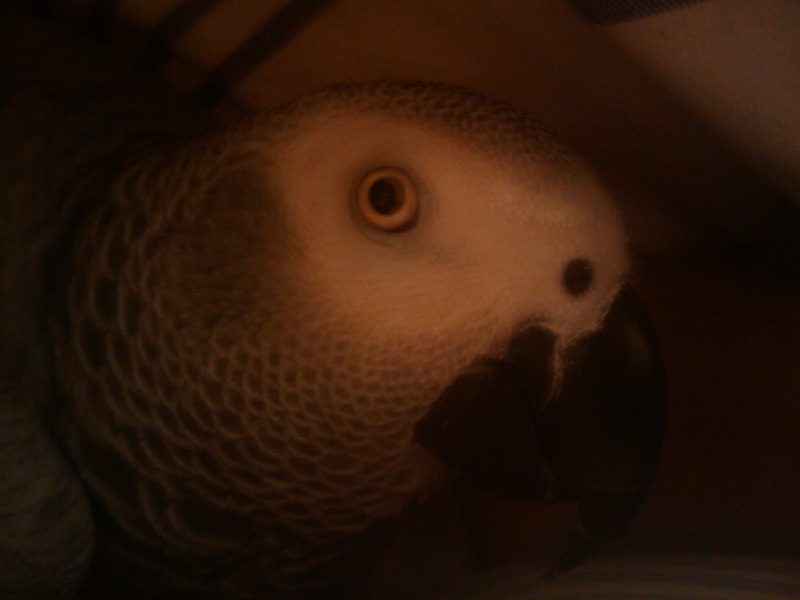 Says Sara ... 'This is the eye of an African Grey Parrot underneath the duvet having the monday early am cuddle.. I do volunteer work 2 days a week so she is 'home alone'.. to sweeten the day, I get up 15 mins earlier than normal and she comes back into bed with me. Right underneath the duvet!' Now isn't that just the most spoilt parrot in the world?! And to end the madness .. there was a great comedy moment in the parlour tonight when David started the circulation cleaning of the milking parlour, without replacing the milk filter housing. There was a shout as a huge jet of pressurised hot water shot into the air. He got absolutely soaked but sadly I was not allowed to take a picture! Saves him having a bath tonight though. The water may have been hot initally but I bet it turned cold pretty quickly in the November night air! !